1 Research National Center of Cassava and Tropical Fruits, Brazilian Company of Agricultural Research, Cruz das Almas, BA, Brazil. 2 Department of Microbiology, Federal University of Viçosa, MG, Brazil. The objective of this study was to detect the presence of acyl homoserine lactones (AHLs), signal molecules of the quorum sensing system in biofilm formed by Hafnia alvei strains. It also evaluated the effect of synthetic quorum sensing inhibitors in biofilm formation. AHLs were assayed using well diffusion techniques, thin layer chromatography (TLC) and detection directly in biofilm with biomonitors. The extracts obtained from planktonic and sessile cell of H. alvei induced at least two of three monitor strains evaluated. The presence of AHLs with up to six carbon atoms was confirmed by TLC. Biofilm formation by H. alvei was inhibited by furanone, as demonstrated by 96-well assay of crystal violet in microtitre plates and by scanning electron microscopy. The H. alvei 071 hall mutant was deficient in biofilm formation. All these results showed that the quorum sensing system is probably involved in the regulation of biofilm formation by H. alvei. Hafnia alvei include a heterogeneous cluster of gram-negative, motile, flagellated rod shaped bacteria that belongs to the family of Enterobacteriacea (Sakazaki and Tamura, 1992). This bacterium is recognized as an opportunistic pathogen, found in many nosocomial infections, such as wounds and enteric, urinary and respiratory tract disorders (Katzenellenbogen et al., 2001). It is isolated from dairy (Desmasures, 1995; Pinto, 2004; Kagkli et al., 2007) meat and fish producís (Lindberg et al., 1998; Gram et al., 1999; Bruhn et al., 2004) as a common bacterial food contaminant. H. alvei has the potential to form biofilms (Jack et al., 1992; Vivas et al., 2008) that confer considerable advantages to it, including the ability to resist challenges from the environment, the presence of antibiotics and sanitizers, and host immune systems. It has been demonstrated that H. alvei produces N-acyl homoserines lactones (AHLs), the signaling molecules involved in the mechanism called quorum sensing (QS) (Gram et al., 1999; Ravn et al., 2001; Bruhn et al., 2004; Pinto et al., 2007). QS is used by many bacteria to coordinate community behavior as a function of population density (Fuqua et al., 1994; Whitehead et al., 2001). In some bacteria, quorum signaling is an essential regulatory component of virulence and other attributes, including biofilm formation (Nadell et al., 2008). The control of biofilms represents one of the most persistent challenges to industry in which these microbial communities are problematic (Kumar and Anand, 1998). Quorum quenching has been proposed as a new strategy to control a range of bacterial phenotypes, including biofilm formation, through interference with the communication system (Hentzer et al., 2002; Al-Batainehetal.,2006). Many organisms in marine environments protect their surfaces from microbial colonization by producing chemical defense compounds. The Australian marine red algae species Delisea pulchra protects itself against colonization by producing a wide spectrum of halogenated furanone compounds, some of which have interesting biological activities against phenotypes involved in the colonization pathways of marine bacteria (De Nys et al., 1995; Manefield et al., 2002). Furanones were found to interfere with QS, thereby inhibiting biofilm formation by Pseudomonas aeruginosa (Hentzer et al., 2002; Al-Bataineh et al., 2006). Considering that QS and biofilm formation are often closely linked, this research aimed to detect the presence of signaling molecules in biofilm of H. alvei and evaluate the inhibitory effect of synthetic furanones on biofilm formation. Psychrotrophic H. alvei strains 059 and 071, isolated from cooled raw milk (Pinto, 2004), were used for biofilm studies in minimal media of salts - MMS (K2HP04 7 g I -1; KH2P04 2 g l-1; MgS04.7H20 0.2 g l-1; (NH4)2S04 1 g l-1; glycerol 4 g l-1 and CaCl2 1 mmol l-1). The strains were stored in brain heart infusion (BHI) with 40% (v/ v) glycerol and maintained at -80°C. Before each assay, they were grown in Luria Bertani broth (LB) (peptone 10 g l-1, yeast extract 5 g l-1, NaCl 5 g l-1) at 26°C for 18 h. AHL production was detected using Chromobacterium violaceum CV026 (McClean et al., 1997), Escherichia coli pSB403 (Winson et al., 1998) and Agrobacterium tumefaciens WCF47 (Zhu et al., 2003) as monitor strains. C. violaceum and E. coli were grown in LB and, when appropriate, the broth was supplemented with 0.75 % or 1.2% (w/v) agar and antibiotics: 20 µg ml-1 kanamycin for C. violaceum CV026 and 20 µg ml-1 of tetracycline for E. coli pSB403. A. tumefaciens WCF47 was cultured in minimal AT media (Tempe et al., 1977) supplemented with 20 µg ml-1 of tetracycline and 100 µg ml-1 of kanamycin. These strains were incubated at 26°C for 24 h, with shaking at 150 rpm, prior the assay. An AHL-lacking mutant of H. alvei 071 was constructed by Campos (2008) and was unable to induce violacein production after 24 h of incubation at 30°C. This mutant was maintained on LB agar containing kanamicin (50 µg ml-1 ) and gentamicin (25 ugml-1). Biofilms of H. alvei 059 and 071 were formed on 15 coupons (2x6x0.1 cm2) of stainless steel in MMS after 24 h of incubation at 26°C, as suggested by Joseph et al. (2001). Coupons were removed from culture media, washed with 0.85 % saline solution, immersed in 150 mi saline and sonicated for 30 min (Ultrasonic Cleaners -model 1510 water bath) to remove the added cells. Cell suspensions were centrifuged at 13,000 g for 30 min (RC5S, Dupont, USA) and AHLs in supernatants were extracted twice with equal volumes of ethyl acetate acidified with 0.5 % of formic acid, according to Ravn et al. (2001). Extracts were filtered and evaporated to dryness in a rotative evaporator (MA 120, Marconi, Brazil). After complete evaporation, extracts were suspended in sterile distilled water. The same procedure was used to obtain extracts from cells in planktonic stages and from uninoculated MMS, as a negative control. The presence of AHLs in extracts was verified by assaying violacein production by C. violaceum CV026, ß-galactosidase induction by A. tumefaciens WCF47 or bioluminescence production by E. coli (pSB403). Bioluminescence produced by E. coli (pSB403) was monitored in a dark room, after 14 h of incubation and images were captured in Eagle Eye II (Stratagene, La Jolla, CA, USA). Twenty-five microliters of extract was dispensed in a 3 mm diameter well made in 1.2 % LB agar, with the addition of appropriate antibiotics and previously inoculated with approximately 107 CFU ml-1 of C. violaceum CV026 or E. coli (pSB403). A. tumefaciens was inoculated in 1.2 % AT agar with appropriate antibiotics. Aliquots of 25 µ of N-hexanoyl-D-L-homoserine lactone (HHL), 75 nmol l-1 or 25 µ of MMS extract were added to wells as positive and negative controls, respectively. Each bioassay was conducted at least twice in an independent manner. The AHLs contained in the sessile and planktonic cell extracts of H. alvei 059 and 071, obtained as described above, were also analyzed by reverse phase thin layer chromatography (TLC) adapted from Shaw et al. (1997). Cultures extract were dissolved in 400-600 µl of HPLC-grade ethyl acetate. Synthetic AHLs or extract samples dissolved in ethyl acetate, in volumes of 10-20 µl, were spotted onto aluminum sheets (C18, RP, 25 4s, Merck, Germany) measuring 20 x 20 cm. The standards used were: α-amino-γ-butyrolactone hydrobromide, N-hexanoyl-DL-homoserine lactone, N-decanoyl-DL-homoserine lactone, N-dodecanoyl-DL-homoserine lactone and N-tetradecanoyl-DL-homoserine lactone (Fluka, Switzerland). The chromatography was run using a solvent system of methanol: water (60 : 40, v/v) and, after running, the solvent was evaporated. The dried plates were overlaid with 30 µl of an overnight culture of A. tumefaciens WCF47. The spots were visualized after overnight incubation at 30°C, according to the monitor strain used and retention factor (R) values were calculated. Biofilms of H. alvei 059 and 071 formed on stainless steel after 24 h of incubation were washed in sterilized 0.85 % saline solution to remove non-attached cells. Each side of the coupons was then exposed to UV light (312 nm, 52 cm of distance) for 30 min in order to inactivate most of the cells. The presence of AHLs in situ was determined by covering coupons with LB or AT agar supplemented with appropriate antibiotics and inoculated with c.a. 107 CFU ml-1 of each monitor strain. The AT agar was also supplemented with 50 µg ml-1 of X-gal. Petri dishes were incubated at 30°C and results were observed up to 24 h. It was previously verified that a few viable cells remained in coupons treated with UV, but no changes in the turbidity of the LB médium was observed within 24 h incubation of coupons immersed in it. This observation discarded the production of considerable quantities of AHLs during incubation of the coupons and monitor strains. Each bioassay was conducted at least twice in two independent experiments. In order to analyze the relationship between AHL production and biofilm formation in H. alvei, we study the effects of synthetic furanones, known Quorum Sensing Inhibitors (QSI)-molecules, on growth and biofilm formation by using the 96-well assay adapted from O'Toole and Kolter (1998). The H. alvei 071 strain was cultured overnight at 26°C, under shaking. Eighteen microliters of H. alvei cultures, with approximately 108 CFU ml-1 , was placed in each well containing 180 µg of MMS media added with synthetic furanones (Fluka Laboratory Chemicals, Milwaukee, Wis., USA). The furanones used were 3-methyl-2(5H) furanone (MF), 2-methyltetrahydro-3-furanone (MTHF), 2(5H)-furanone (F) and 2,2-dimethyl-3(2H) furanone (DMTHF), at the final concentration of 0.01, 0.1 and 1 mol l-1. The microplates were incubated at 26°C for 24 h and the cell growth determinate at 600 nm. The planktonic cells were removed and the remaining adherent cells were stained for 30 min with 200 µg of 0.1% (w/v) crystal violet solution dispensed in each well. Excess stain was removed by washing three times with distilled water and 200 µ of 95% (v/v) ethanol was added to the wells to release the stain. The extent of biofilm development was determined by measuring the absorbance of the resulting solution at 600 nm. For each experiment, correction for background staining was made by subtracting the valué for crystal violet bound to uninoculated controls. The biofilm assay was performed twice, with triplicates in each assay. The data were expressed as the ratio between the optical density relative to the sessile and total cells and were submitted to variance analysis. When it was significant, the Dunnet test at 5% of probability was employed using the Windows 2006 versión of the Genes program (Cruz, 2006). 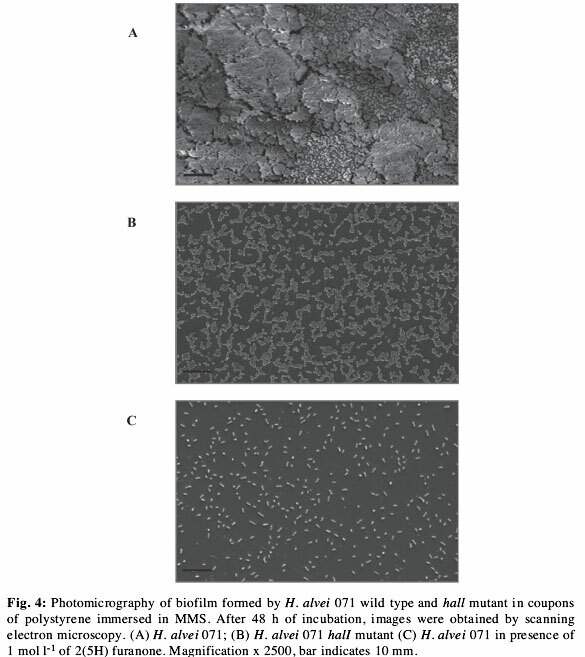 Confirmation of the presence of biofilm on polystyrene was obtained by scanning electron microscopy. Two hundred microliters of high DO 600 nm activated cells of H. alvei 071 and H. alvei 071 hall mutant were inoculated in 24 wells on polystyrene microplates containing MMS, with 1 mol l-1 of 2(5H)-furanone added, obtaining a final volume of 2 ml. As controls, MMS was used with a suspensión of cells added and MMS without any addition. Polystyrene coupons measuring 1 x 1.2 cm were immersed in the wells and microplates were incubated for 48 h. Coupons of each treatment were removed and submitted to appropriate treatments before being observed in a scanning electron microscope (Leo®, model VP 1430). Extracts obtained from planktonic cells of H. alvei 059 and 071 cultured in MMS induced violacein production by C. violaceum CV026, ß-gal production by A. tumefaciens WCF47 and bioluminescence by E. coli pSB403. However, extract from sessile cells of both strains did not activate a quorum-sensing response in C. violaceum CV026. 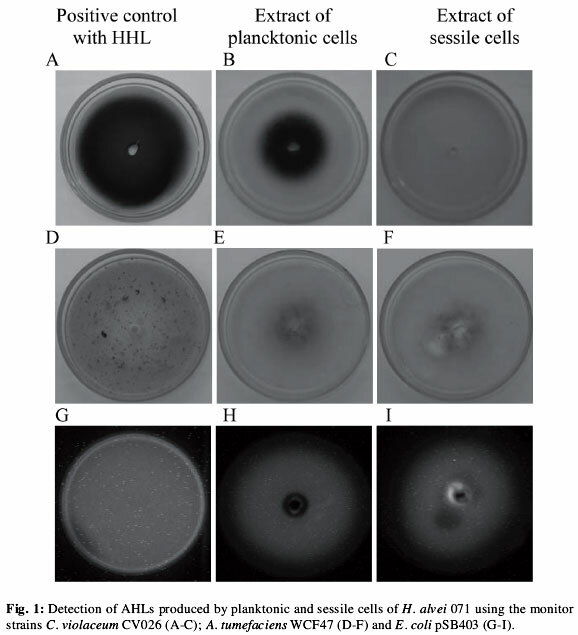 The results obtained with H. alvei 071 were presented to illustrate the detection of AHLs in extract of sessile and planktonic cells (Fig. 1). 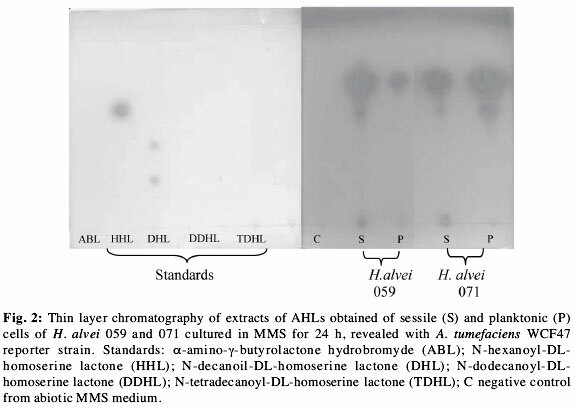 In agreement with the results obtained with the different reporter strains, TLC experiments allowed us to characterize the homoserine lactones molecules produced by the strains in the sessile and planktonic stages (Fig. 2). Comparing the R/ values of spots from samples with standard spots, it can be inferred that H. alvei produced AHLs with carbon chains similar to HHL, whose acyl chain might be substituted or not at the third carbon atom. However, spots corresponding to HHL were not detected in extract of planktonic cells of strain 059 (Fig. 2). The production of molecules with carbon chains composed of less than six carbon atoms was also demonstrated. Although the forms of spots obtained were different, the oxo and hydroxy derivatives, with the same chain length, migrate with no distinguishable mobility in the solvent system. H. alvei strains produced AHLs in biofilm formed on stainless steel and these molecules were detected by at least one monitor strain, with A. tumefaciens WCF47 being the most sensitive to AHL (Table 1). 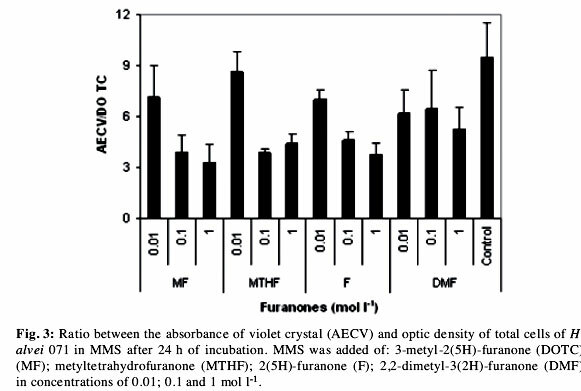 Furanones added to MMS broth up to 1 mol l-1 did not affect OD600 nm (P>0.05) relative to growth and biofilm formation of H. alvei 071. However, when the ratio between the optical density relative to the sessile and total cells was calculated, a significant reduction (P<0.05) in biofilm formation was determined in the presence of MF, MTHF and F in concentration higher than 0.01 mol l-1 when compared to control (Fig. 3). In our experimental conditions, furanone DMTHF did not cause a significant effect (P>0.05) on biofilm formation by H. alvei 071 (Fig. 3). The wild type of H. alvei 071 formed a densely packed biofilm (Fig. 4A), whereas the hall mutant appeared to grow rather as discontinuous sheets on the polystyrene surface (Fig. 4B). The addition of 2(5H)-furanone (F) to the culture media reduced the cell number of H. alvei 071 adhering to coupons and after 48 h of incubation, isolated cells predominated. There is clear evidence that biofilm formation is a carefully orchestrated process that is dependent on quorum sensing and that AHLs affect several aspects of biofilm dynamics in gram-negative bacteria, such as heterogeneity, architecture, stress resistance, maintenance and sloughing (Davies et al., 1998; Allison et al., 1998; Kjelleberg and Moli; 2002). Our results demonstrate the presence of AHLs in sessile cells of H. alvei on stainless steel determined by using culture techniques (Fig. 1) and by TLC (Fig. 2). This is strong evidence that QS also has a role in regulating biofilm formation in the evaluated strains. This kind of signal molecules has also been reported in biofilms formed by other bacteria, such as Nitrosomonas europea (Batchelor et al., 1997); P. fluorescens B52 (Allison et al., 1998); P. aeruginosa (Davies et al., 1998); Serrada marcescens (Rice and Koh, 2005): Burkholderia cepacia (Gotschilich et al., 2001; Huber et al., 2001; Conway et al., 2002) and Aeromonas hydrophila (Lynch et al., 2002). Although AHL production by H. alvei has already been reported (Gram et al., 1999; Bruhn et al., 2004; Pinto et al., 2007) this is the first time that AHL molecules were characterized in biofilms produced by this bacterium. This finding could help to better understand the adherence properties of H. alvei. Because H. alvei formed biofilms in stainless steel, it has the potential to colonize food-processing surfaces, and to be a continuous source of contamination when cells get detached from the biofilm and come in contact with food products. Cells of H. alvei 059 and 071 attached in biofilm did not induce violacein production by C. violaceum CV026, but induced responses in A. tumefaciens or E. coli (Table 1). This result confirmed the importance of using diverse monitoring systems to detect AHLs. It should be emphasized that a negative response in this assay shows an inability to produce AHLs that are recognizable to C. violaceum CV026 or that the number of AHLs is very low or zero. Every monitoring system presents different degree of sensitivity and responds to specific groups of AHL (Zhu et al., 2003). For example, C. violaceum CV026 does not detect AHL with hydroxy substitution in the acylated chain and lacks sensitivity to many oxo derivatives (McClean et al., 1997; Cha et al., 1998). The observation that the addition of furanone to culture media affected biofilm formation by H. alvei 071 (Fig. 3) can be attributed to inhibition of the QS system of this bacterium. Furanones can bind to the LuxR protein, thereby reducing the amount of protein available to interact with AHL or promoting the degradation of this protein, thus impeding the transcription of genes involved in regulation of biofilm formation (Manefield et al., 1999; Rasmussen et al., 2000; Hentzer et al., 2002). The inhibition of the expression of phenotypes controlled by QS by furanones was already recognized in a range of bacteria. Givskov et al. (1996) demonstrated that swarming migration of pathogenic bacteria Serrada liquefaciens on agar surface was completely inhibited by the addition of 100 mg l-1 of (5Z)-4-brome-5-(bromomethylene)-3-butyl-2(5H)-furanone. This molecule also suppressed the expression of luminescence genes, localized in a reporter plasmid in S. liquefaciens, without affecting bacterial growth rate. Furanones also inhibits virulence genes, as seen by the production of extracellular toxin in the pathogenic strain of Vibrio harveyi (Manefield et al., 2000). A mutation that blocks generation of the signal molecule hinders abnormal biofilm formation by H. alvei 071, whereas the presence of 1 mol l-1 of 2(5H)-furanone inhibited the biofilm formation (Fig. 4). These results suggested that a cell-to-cell signal is required for the differentiation of individual cells of H. alvei 071 into complex multicellular structures. Inhibition of biofilm formation was verified in P. aeruginosa using furanone 56 and this substance did not influence the initial adhesión process, but affected the biofilm architecture and increased the detachment process, leading to loss of biomass from the substrate (Hentzer et al., 2002). These authors also observed that this substance reduced the expression of virulence genes, indicating a general effect of furanone 56 on target genes of las circuit of QS in P. aeruginosa. The precise role of AHLs in biofilms remains to be established and more studies should be conducted to elucidate the involvement of QS in the different stages of biofilm formation by these bacteria. E.S. Viana was supported by CAPES-Brazil fellowship. The authors are grateful to Claudia Alencar Vanetti for her assistance with the electronic microscopy. Received: September 24, 2008. In Revised form: September 9, 2009. Accepted: September 10, 2009.